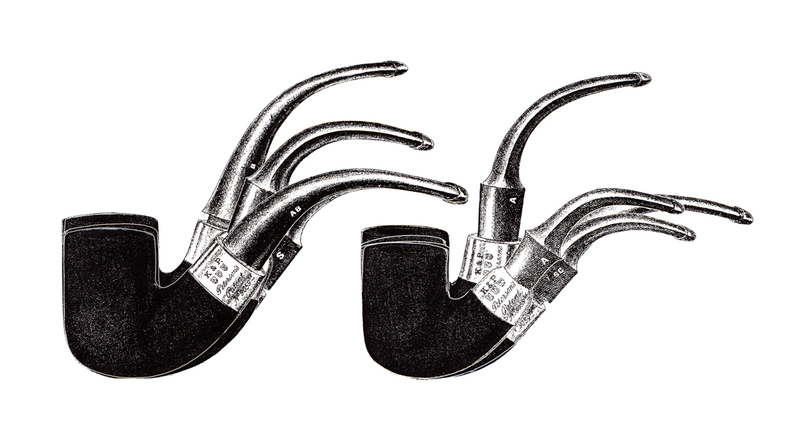 Of course naming a pipe shape is as old as pipes and pipe-makers. 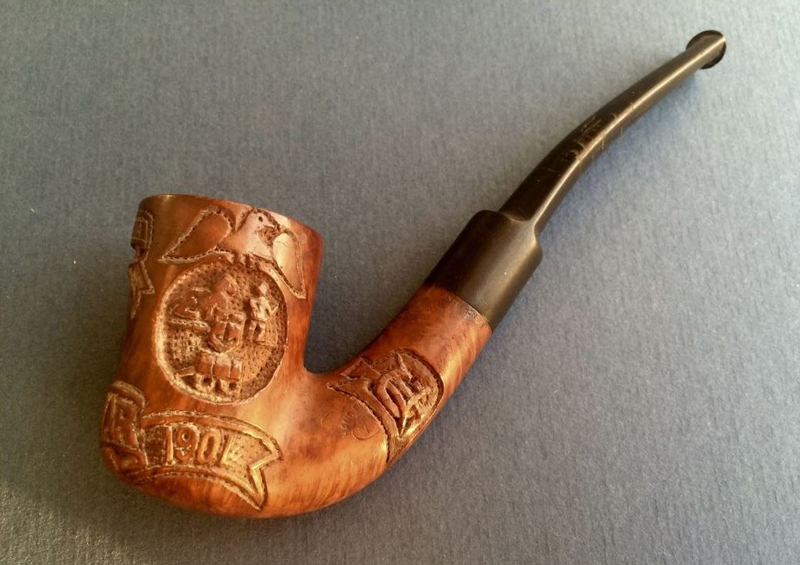 In the early days of briar pipe-making companies commonly had different names for the same shape, but over time one name usually took the ascendancy and a shape settled down to just one name—Dublin, bulldog, and Rhodesian come to mind. Or in some cases, the pipe is known by two names –the Oom Paul (or Hungarian) and the Zulu (often called a yachtsman by the Great Generation). Bill Burney’s great shape chart for the old ASP is a forceful argument for the usefulness of these names, and I remember in my early days devouring every shape chart I could lay my hands on. Even more recent artisan shapes, once they become common enough, generate a common name—blowfish, volcano, acorn and fig, to name a few. Peterson’s named shapes are found in the very first catalog in 1896 with the Cad or Bull Dog.2 By the 1906 catalog there are over a dozen named shapes, most of which we identify in the book. Readers of this blog will recall posts on both the Kaffir (now in the catalog as the reproduction B35) and the John Bull (original 999 shape, discontinued in the 1980s). The shapes are still known in the hobby—the first a predecessor of the Zulu and the second as an author. But there’s something special, I think, in knowing what K&P called them. 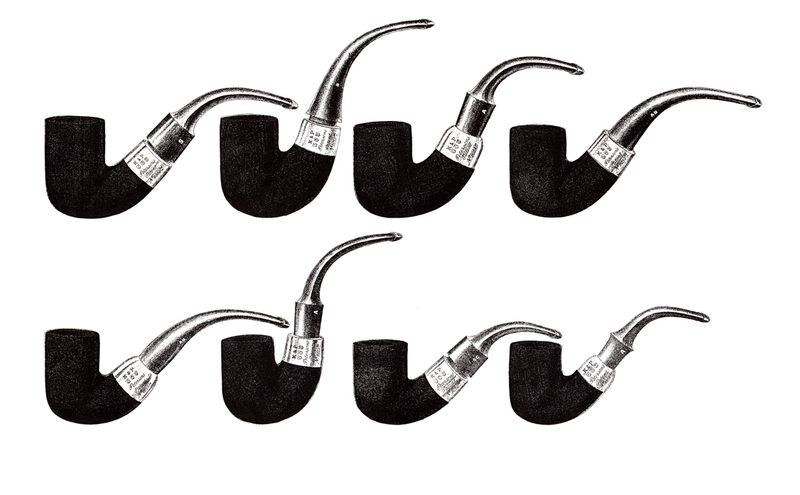 Peterson had some fascinating names for their shapes early-on, and continued to name a few of their shapes throughout the twentieth century: the Large Bolton (shape 50, 1947 shape chart), the Bent Albert (shape 268, 1947 —what we call a Zulu), the Medium Squat Cad (shape 495 in the 1947 chart—one of Linwood Hines’s favorite shapes). Then there’s the Tankard and the Barrel and the Calabash and the Belgique, a quartet or set of twins that appeared in the mid twentieth-century. After that, we have to fast-forward to 1981’s Mark Twain for a named shape and the incredible outpouring of special collection pipes which followed, most of which all have names before entering the numbered B shape chart. The only example of a named shape with no number since 1981’s Mark Twain is the Large Tankard, which, appropriately enough, appeared as a companion piece in the 2010 reissue of the Mark Twain. For those with eyes to see, it was this shape family that was featured in the ubiquitous engraved version of the Thinking Man, where it appears as a 4s. But while it had a shape number by 1906, it wasn’t given a shape name in Peterson ephemera until the 1947 chart, and then it’s as the “Bent Dutch” for shapes 337 and 338, not the larger 4s / 309, which name would come later. 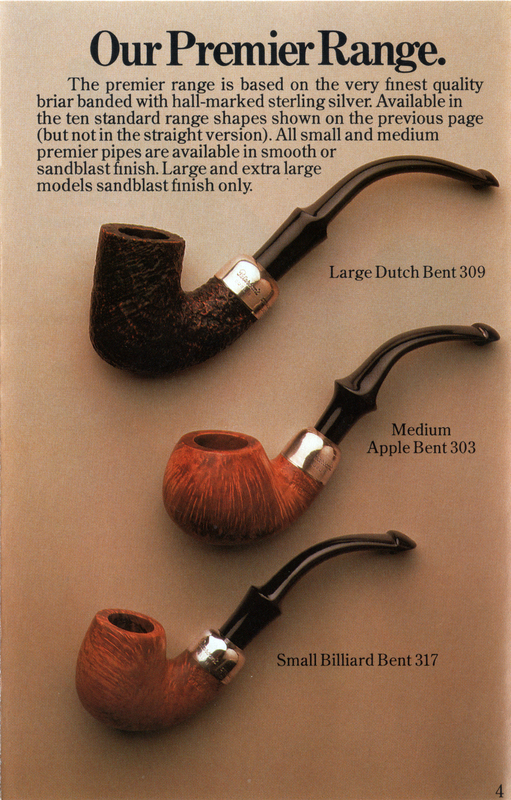 The 1981 “Mark Twain” point-of-sale brochure takes up the name for the first time after a 34-year hiatus, tagging the 313 as a “Medium Dutch Bent” and the 309 as a “Large Dutch Bent.” The 1983 catalog drops “Bent” off the end of the two shape names, just settling for “Medium Dutch” and “Large Dutch.” The 1984 catalog added back the bent to the end of each name. The name was used only one more time, shortly after Tom Palmer assumed direction of the company, in the 1992 Hand Made brochure. The Caramel Spigot 01: A “Squat Dutch”? So now to the name’s origin. As with most of life’s thornier problems, you can approach it with a hermeneutic of suspicion or a hermeneutic of trust—the former being very useful in politics and sophomore logic classes, the latter for any situation requiring metaphor or the larger issues of life. I recently read online a lengthy, pedantic article attempting to trace the origin of the Oom Paul shape name, and after wading through what seemed like five or six thousand words, the author threw his hands up at the end and said there wasn’t any conclusive evidence to connect the shape name with the South African patriot, President Paul Kruger. Hmm. I suspect the author couldn’t see the forest for the trees, because this is one of those cases where oral history, tradition and myth convey a truth greater than documented historicity. We’ll be talking at length about Peterson’s fortuitous (and yes, literal) connection with President Kruger in the book; suffice it here to say that there seem to be not two but three Peterson pipes that received names in the Boer Wars: the Oom Paul, the Kaffir and the Dutch Bent. When Irish servicemen came back from the Boer Wars, they didn’t have to look far to find the shapes they’d enjoyed—just up on Grafton Street. You can imagine the conversation between the shop-keeper and the soldier: “I want one that looks like this,” he says, pointing at a pipe in the case, “a Dutch Bent!” The shop-keeper knowingly nods his head, remembering for future reference that customers know the 313 (8s) and 309 (4s) shapes by name. As the old soldiers died off, they passed along their name for the shape to the next generation, but as the years went by, it must have become more and more difficult for anyone to recall why they called it what they did. Kapp & Peterson weren’t the only company to made a Dutch Bent, and probably weren’t even the first. But they deserve to be recognized as the most important company to make the shape, to have had it in production longer than any other company, and certainly to have made it uniquely their own since its debut in their 1896 catalog. They’re still found in abundance on ebay, and Peterson has even released a handful this year in several lines–the Killarney, the Donegal Rocky, and the promise of the Derry Rustic to come. Dia bheith in éineacht leat. 1 When I recently asked Tony Whelan, Jr., factory manager at Peterson, if he could tell me why the 309 and 313 were called “Dutch Bents,” he replied that neither he nor anyone at the factory had ever heard them called by this name. The shift seems to have happened at the university of Oxford. Lads from the town who hung about colleges in the hope of casual work of the caddie type were called cads by the undergraduates. It became a contemptuous way to describe townsmen and by about 1840 it had achieved its full flowering as a term for a man whose behaviour was unacceptable” http://www.worldwidewords.org/weirdwords/ww-cad3.htm, accessed 5/21/16. 3 Email to Mark Irwin, 5/22/16. Andy, thanks for the kind words. And thank you for your support of the book and contributing to its research! Yes, another fascinating exploration into the past of Peterson’s. 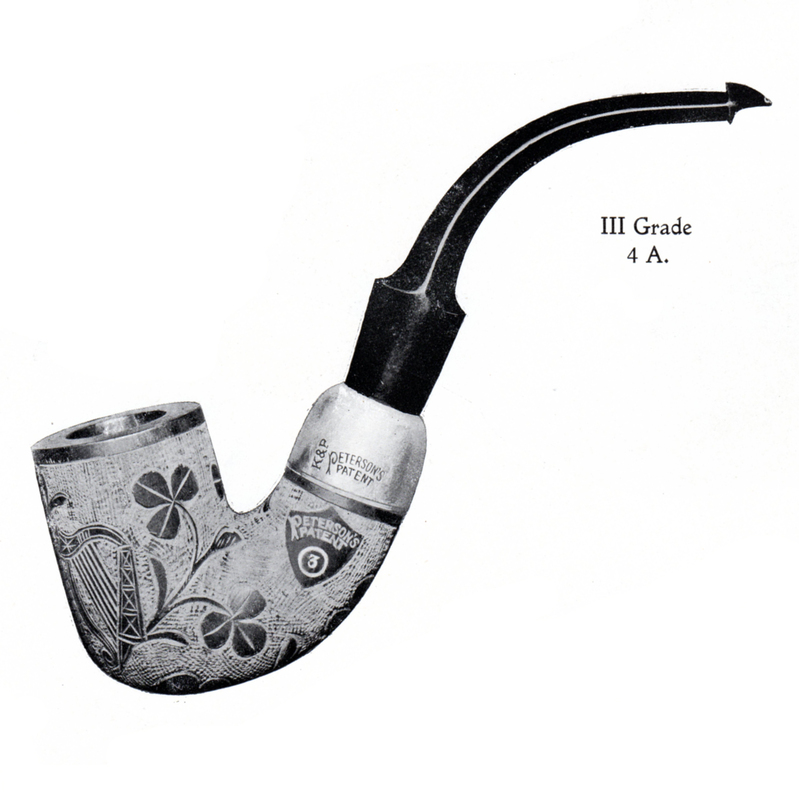 Have you ever seen a pipe like the 4A at the top of the page in the flesh? I was also not familiar with the nickname “Cad” for a bulldog. Thank’ee kindly, good sir. Never seen an Irish Emblems in the 4a, although I did get a 314 System just for the book with this identical style of carving. As you can see from the III Grade, K&P carved emblems not on the 1st quality briar, but 3rd. Makes sense–why waste beautiful grain? I also have a later, similar Irish Emblems in a 313, both of course w/ nickel mounts. Paddy Larrigan told me in 2013 that Peterson had an out-of-house carver who would do these for them as late as the 1950s. The 313 has an Irish county’s name across the bottom, similar to the kind of thing seen on the Boer War pipes. 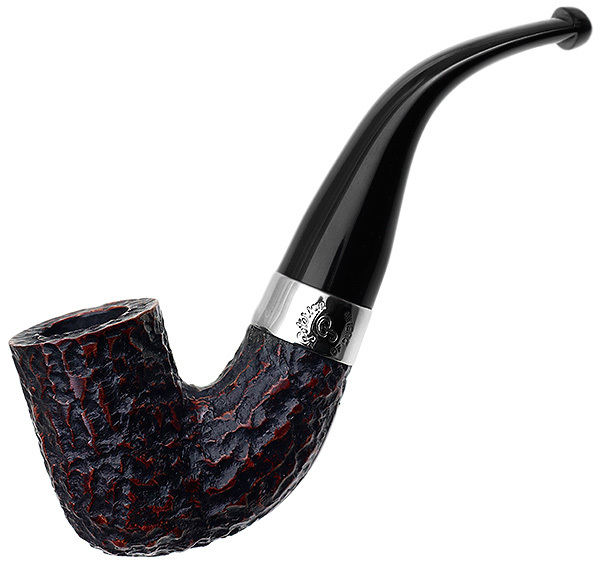 I recently required a pipe that looks like it is a Bog Oak 338. I love how it smokes. The stamping on it is weird though. It seems to say 2BB. Any thoughts on this? Hi Jim, I think what you’re looking at is the 02 shape, the B indicating a tapered stem. I wish it were bog, but all our research has yet to uncover any bogs aside from the small straight dublin shapes carved with shamrocks (you can see one in the Sweet Petes blog a few months back). I’d love to take a closer look at it (band, etc)., as I can’t tell for sure if its rusticated or blast. It looks like rusticated. 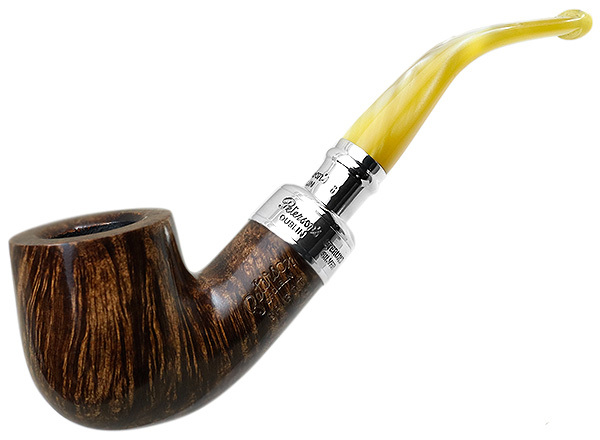 Peterson didn’t do much blasting until the Dunhill patent expired in the late 1930s. Your measurements can confirm it as an 02 if you want to post them (I’ll compare with a few examples here). Mine are great smokers!